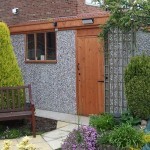 A Concrete Sectional Building is strong and secure making an ideal Shed or Workshop. The robust construction gives years and years of maintenance-free service unlike a wooden building which needs constant maintenance, is flimsy in construction, lacks security and needs totally replacing after a very short time. 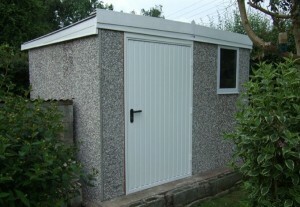 Large or small – Concrete Sheds and Workshops are available in a vast range of sizes from a small unit to house the wheelie bin/recycling through to a huge Workshop often used by small businesses. 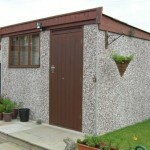 Extra height is available throughout the Prefab Concrete Shed and Workshop range. Pitched or Pent roof – An Apex roof or the Pent roof with a slope to the rear of the building available in a variety of wall finishes and roof materials creating a building that will blend well into it’s surrounding area. 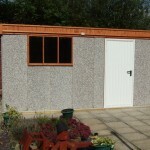 Prefab Concrete Sectional Sheds and Workshops can be customised to individual requirements. Windows and doors can be situated in any elevation. 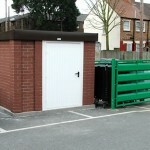 Dividing walls to split the building into sections can be installed enabling the building to be used for various uses. 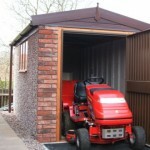 To create a cosy work environment the Sheds and Workshops can be easily lined out and insulated. Or maybe just a Shed!! 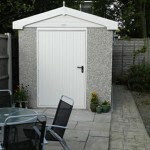 Our FREE BROCHURE PACK shows all our Concrete Sectional Sheds and Workshops, their options and prices. © 2015 Wessex Concrete Sectional Garages All rights reserved.